New Yorker: “Blood Simple” has no sense of what we normally think of as “reality,” and it has no connections with “experience.” It’s not a great exercise in style, either. It derives from pop sources—from movies such as “Diabolique” and grubby B pictures and hardboiled steamy fiction such as that of James M. Cain. It’s so derivative that it isn’t a thriller—it’s a crude, ghoulish comedy on thriller themes. 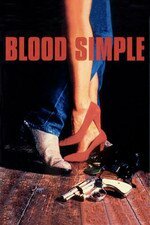 Roger Ebert: The genius of "Blood Simple" is that everything that happens seems necessary. The movie's a blood-soaked nightmare in which greed and lust trap the characters in escalating horror. The plot twists in upon itself. Characters are found in situations of diabolical complexity. And yet it doesn't feel like the film is just piling it on. Step by inexorable step, logically, one damned thing leads to another. Film Noir of the Week: The knockout performance of the film hails from its villain, a role written specifically for the actor. Had the Coens produced Blood Simple on the heels of Fargo, it’s likely M. Emmet Walsh would have been given an Oscar nod. Watching Walsh settle in as the husky, dissipated Visser is a real treat for the viewer. With his high-crowned woven cowboy hat, chunky turquoise ring, and pastel yellow leisure suit, Visser borders on the comical but his calculating reptilian eyes veer him into the grotesque. At separate points in the film a beetle and a fly land on Visser’s face and explore the terrain. Whether it’s a bit of movie-making luck or orchestrated by the Coens, the viewer understands: here is a bottom-feeder; insects can smell the death on him. Walsh is so good at being bad that by the end of the film you may be rooting for him, or at least hoping he’ll go out in a blaze of glory. You will not be disappointed. This might be my favorite Coen Brothers movie. In large part because I saw it in the theater with no preconceived notions. Plus, I got all sorts of bonus point because I was able to talk my wife, then girlfriend, to go see it with me and impressed her with my movie acumen. Shorty thereafter I talked her into seeing Repo Man with me, and lost every one of those points. The plot-engineering here is amazing. My favorite aspect of it is trying to imagine being the police detective who will get called in on this case immediately after the movie ends. That guy is screwed, because there is no way in the world to make of sense of what happened after the fact from any point of view except that of audience. Shorty thereafter I talked her into seeing Repo Man with me, and lost every one of those points. Despite this, you married her? The plot-engineering here is amazing. Agree. On of the laugh out loud moment occurs at the very end with McDormand's "I'm not afraid of you anymore, Marty" line, which highlights that everyone in this movie is operating under a different set of facts, none of them correct. This is still my favorite CB movie. I love it the way I love Shallow Grave, which I feel confident it strongly influenced. I'm reminded a little bit of the recent Blue Ruin, perhaps because of the increasingly complex problems that ordinary people find themselves in when murder is involved. There are a lot of tense moments in this film, but the middle sequence when Ray finds Marty and eventually buries him is incredible. After I watched Fargo I kind of had the impression that the Coens didn't feel Blood Simple got the love it deserved, and had lifted some scenes from it for Fargo. One thing I noticed this time around was that Jon Polito's private eye character in The Big Lebowski drives a VW Beetle, just like Loren. I'd have to watch TBL again to see, but there was a shot in Blood Simple, when Ray is being followed by Loren, that reminds me an awful lot of a similar shot in TBL, when were introduced to Jon Polito's character. Come to think of it, do Ray and The Dude drive the same car? Maybe I'll need to watch again. Just wanted to leave a note here for fellow old people who first saw this on VHS and recall the movie ending with "I'm a Believer." Turns out that was a rights issue. The restored print ends with "Same Old Song" as originally intended. I had to look it all up last night after seeing the restored print at Film Forum, because boy howdy did the ending make an impression back in the day and I was seriously shaken by the prospect that I had misremembered it. Of course now I feel stupid for liking the VHS ending, but at least my memory's not playing tricks on me.